EMILY BRONTE is my lifelong fascination and I attempt to understand her as a person and as a genius in many ways...most recently I have been seeking her in images, both found images and images of my own creation. 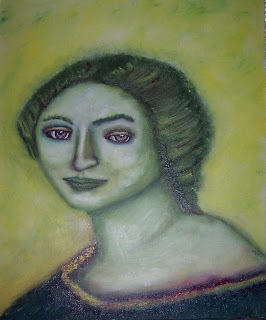 This is my painting in oil of Emily, inspired by Branwell's painting of his sisters. Emily seems to have a small face, with a faraway gaze, bold lips and strong nose. She is yet illusive. I imagine her striding and even running across the moors, alone or with her dogs, completely content under that ever changing sky. What did she look like then....how to depict that joy...that is what I seek. Another image of Emily that I painted was inspired by a photo on an old book of her poems that was thought by some to be of Emily Bronte.